Types of Soil in the U.S. Soil is formed over long periods of time from localized materials, which are broken down by temperature changes, rainfall, drought and wind. Biological factors, such as microorganisms, animals, humans and plants also affect the development of soil. Types of soil are classified according to measurable properties, including the color of the soil, the size of the particles, the amount of organic material and the amount and type of mineral in the soil. There are 12 soil types, or orders, in the United States. These are further divided into suborders, great groups, subgroups, families and series, resulting in more than 100 different types of soils. 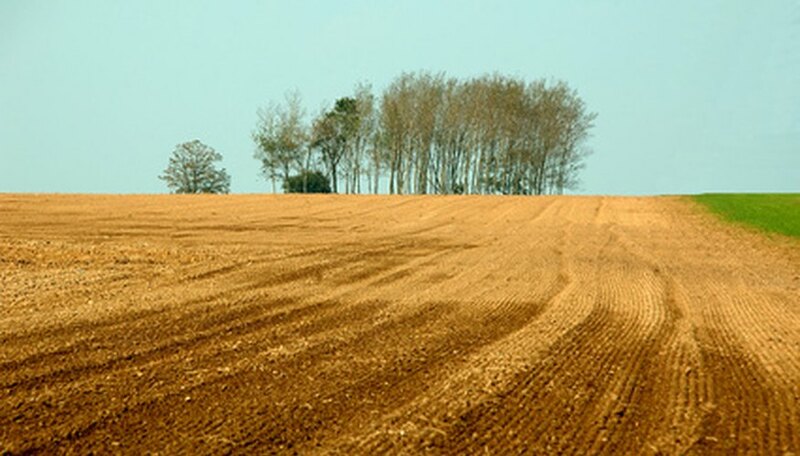 Entisols are fairly new soils and have not developed horizons or layers. Soils that do not fit into any of the other orders are usually classified as entisols. They are typically located on rocky hillsides, as well as on floodplains and river deltas. The greatest concentrations of entisols in the United States are in the High Plains region and the Rocky Mountains. Inceptisols are slightly older soils than entisols. They are just beginning to develop horizons, but do not have any of the features of the other orders. Inceptisols are found mainly in hilly or mountainous areas, such as the Rocky and Appalachian Mountains. Alfisols are highly fertile soils that were formed in forested areas. They are good for farming because they contain some clay, which helps retain moisture, and are usually located in temperate zones. A wide area from South Texas up through Michigan in the United States is composed of alfisols. Mollisols were developed in the grasslands and contain large amounts of organic material. The dark-colored soils are excellent for growing grains. Most mollisols are located in the Great Plains region. Ultisols are acidic and highly leached soils, with a clay subsurface layer that contains a high amount of iron. They were formed in forests in temperate and subtropical areas that receive a fair amount of rain. Ultisols are located primarily in the Southeastern area of the United States. Aridisols have high concentrations of calcium carbonate and are composed of layers of clay, gypsum, salt and silica. They were developed in regions that were dry for long periods of time. Most aridisols are located in the desert areas of the Southwest. Vertisols are rich in clay, and swell or shrink according to the water content. They are found in Texas and the Delta region of Mississippi. Oxisols were formed in tropical and subtropical rainforests. They are greatly weathered, heavily oxidized and not very fertil,e with the exception of a thin surface layer of organic matter. They mined extensively for iron and aluminum in areas where the rainforests have been cut down. Oxisols are only found in the Hawaiian Islands in the United States. Andisols were developed in the ash and debris of volcanoes, and contain large quantities of porous material and glass grains. This allows the soil to hold a substantial amount of water. Andisols are found near active and recently active volcanoes in the Cascade Mountains and the Hawaiian Islands. Spodisols are highly acidic, with high levels of aluminum and iron. As water leaches through spodisols, it becomes acidic and causes heavy weathering of lower horizons. Spodisols have poor fertility, except for trees that prefer acid soil. They were formed in coniferous forests and are found in the Northeastern United States and the upper peninsula of Michigan. Histosols are composed of at least 20 to 30 percent organic matter. They were developed in low-lying swampy areas, where the water prevented the organic matter from quick decomposition. The largest areas of histosols in the United States are in the Great Lakes region and along the Gulf Coast. Gelisols are mostly located in Alaska. They are formed in regions that have permafrost within 2 meters of the surface, which are areas in the high mountains or near the Poles. Since the organic matter doesn't decompose very fast, gelisols contain large amounts of carbon material. What Types of Soil Does Iowa Have? What are Savanna's Soil Types?